That mythology needed someone the audience (or at least the kids in the audience) could identify with--as well as an emotional core--and that takes the form of Tim, the imaginative young boy living an idyllic life with his loving parents until his new brother comes along to ruin everything. Not trusting the new intruder, Tim makes it his mission to figure out what this besuited baby with a briefcase is up to, and get his previous life back. Tim is the film's biggest strength and its biggest weakness because it's established from the start that he's incredibly imaginative, with the film's animation taking its cues from him to create a fantasy world in which he goes from being an astronaut to a ninja to a prisoner, not to mention having conversations with his Gandalf-esque alarm clock (one of the funniest parts of the film.) Making the lead (and narrator, when voiced from the future by Tobey Maguire) into a new-generation version of Looney Tunes' Ralph Phillips, also makes him into a potentially unreliable narrator, and it's entirely possible that the idea of the baby as an invading corporate raider is just in Tim's head, which distracts the viewer unnecessarily. Though a large part of the film focuses on the conflict between Tim and the Boss Baby, that's all set-up (including an entertaining sequence pitting Tim against Boss Baby's crack team of toddlers in an all-out chase scene--which also unfortunately furthers the unreliable narrator problem), in order to explain this world to the viewer and establish why Boss Baby arrived in Tim's home. The story opens up once Boss Baby's mission is explained, forcing Boss Baby and Tim to team up to get what they want. Their plan of action doesn't make a great deal of sense (try and figure out what they expected to happen) but why let that stop you? When the bad guy's plot is predicated on a pun, logic and reason go right out of the window. Baldwin, doing a slightly toned-down version of his Glengarry Glen Ross character, is the film's engine, as his braggadocio is fun coming from an infant, while Miles Bakshi (grandson of the iconic animator) does a fine job as Tim, providing the right tone for the character. Jimmy Kimmel and Lisa Kudrow are also on board as Tim's parents but they don't have a lot to do in the film. That can't be said for Steve Buscemi, who gets to vamp as the head of a major company, and his presence is a treat. Though the plot has plenty of issues (when done, ask yourself what happened to the product at the center of the film? ), there's no questioning the creativity on display in the animation effort, which takes full advantage of the art form's possibilities, moving from fantasy to reality (perhaps?) with ease, depicting Tim's imagination with style and making the movie feel like animation, rather than just computer-rendered reality. When one character tells a story and the visuals take us inside a pop-up book of that tale, it's an exciting and unique way to deliver what might have otherwise been just a simple flashback or fantasy aside. If director Tom McGrath (the Madagascar franchise) and his crew had a tighter, more streamlined script (the film runs 97 minutes, but feels like it's at least two hours long, thanks to several scenes of filler), this had a chance to be a classic, rather than a rather impressive animation demo that's unevenly entertaining. The special edition release of The Boss Baby arrives as a two-disc set (one Blu-ray, one DVD) in a standard-width, dual-hub Blu-ray keepcase with a slipcover that repeats the cover art. The discs feature animated menus with options to watch the film, adjust languages, select scenes and check out the extras. Audio options include English DTS-HD Master Audio 7.1; French, Spanish and Portuguese Dolby Digital 5.1; and Danish, Finnish, Norwegian and Swedish DTS 5.1 tracks, while subtitles are available in English SDH, French, Portuguese, Spanish, Danish, Finnish, Norwegian and Swedish. 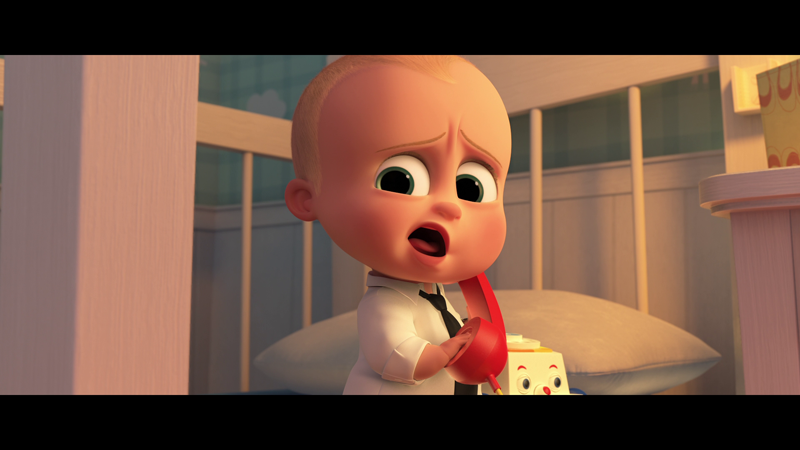 Presented with a 2.35:1, 1080p, AVC-encoded transfer, The Boss Baby looks great, showcasing all the bright, bold and cartoony animation in the film with a clean, sharp and colorful image. There's so much going on through the movie, both in action and styles, and the picture never misses a beat, with a high level of fine detail and a gorgeously diverse spread of hues ranging from natural suburban earth tones to a garishly neon palette. (At one point the film mimics a pop-up book brilliantly, while approximating old-school 2D cel animation elsewhere to great effect.) Black levels, where found in Tim's sunny world, are strong, with solid definition, while digital distractions are not a notable issue. The DTS-HD Master Audio 7.1 track for The Boss Baby feels like its default is a bit lower than you might expect (especially when the DVD copy blares in comparison.) Once adjusted, however, the sound is excellent, particularly in terms of the Hans Zimmer score (which has serious range, including a fantastic �70s cop-film phase) and the atmospheric effects, which serve to create a full soundstage through well-placed directionality and overall strength. The low-end makes its presence known through some precision applications (rather than wall-to-wall rumbling), especially later in the film, while dialogue is clear and easily understood from top to bottom. There's a pretty extensive collection of brief extras, though there's very little here that talks about the production of the film, with the focus placed on in-world content, starting with "Babycorp and You" (3:03), an orientation video for new management employees made with re-edited footage from the film and new narration. There's not much of a gag here, outside of the parody of old-school educational films. Buscemi (as his wonderfully-named character Francis Francis) gives voice to "The Forever Puppy Infomercial" (2:09), which explains the idea behind the film's key plot point. Like the orientation video, it's not clear what the value is here. The 3:26 "Babies vs. Puppies: Who Do You Love?" is a bit better, a segment from the supposed "News Past Your Bedtime", with man-on-the-street interviews (who look suspiciously like creative crew on the movie) and factual comparisons about cost and feces, in an attempt to crown a winner in a competition of cuteness. "The Boss Baby and Tim's Treasure Hunt Through Time" (3:35) is the now-mandatory short required from any kids movie home-video release, but this one is a bit lacking, as the film is done in a motion-comic style of animation with narration from Tim's Wizard clock. It feels pretty lazy in comparison to most such extras, almost told in a way to require the least animation possible. What seems to be a faux Baldwin narrates "The Boss Baby's Undercover Team" (2:17), a collection of profiles of the Boss Baby's toddler co-conspirators, using footage from the film, done in a similar way as the orientation video. The 3:37 "Cookies for Closers: Inside Babycorp" is the first discussion of the actual production of the film, with interviews with some of the cast and crew, as they discuss the plot and characters. Kimmel, Kudrow and Buscemi join Baldwin in "The Great Sibling Competition" (3:27), as they talk about their own experiences with their brothers and sisters (or in Baldwin's case, his children) and how their siblings influenced their approach to the film. 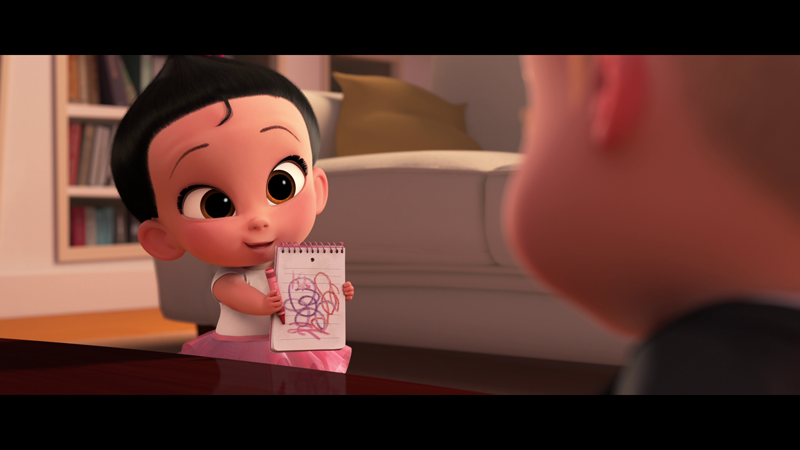 11:30 of animatics are found in "Happy Accidents: The Deleted Scenes of The Boss Baby", with intros from McGrath and producer Ramsey Naito, as they talk about why the scenes were cut from the film and the general concept of animation editing. The Boss Baby extras wrap with a gallery of concept art, available to watch as a 3:03 autoplay experience or a 39-item manual slideshow and the film's theatrical trailer (2:01). An assortment of promotional content for other Dreamworks films can be found in the generically-designed "World of DreamWorks Animation" section, featuring music videos and trailers from Shrek, Madagascar, How To Train Your Dragon, Kung Fu Panda, The Croods, Turbo, and Home, while several trailers for recent Dreamworks films are also included. 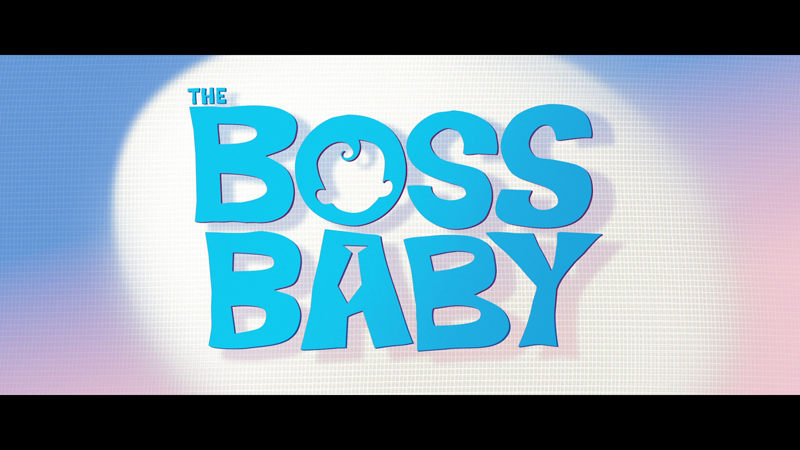 Though the plot is full of holes, the reliance on gross-out gags is tiring and the ending isn't exactly satisfying, there's enough style and creativity in the animation and enough of an effort in Baldwin's performance to make The Boss Baby a more enjoyable experience than you might expect. The presentation is very nice, though the extras will leave older viewers feeling underserved by an array of fluff. 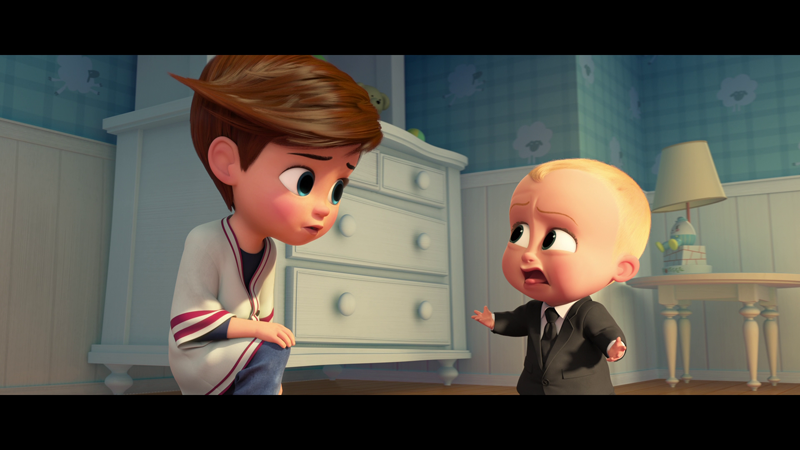 The Boss Baby is a cross-generational crowd pleaser that doesn't hold up to a deeper examination, but you may have a good time anyway.